Samtec, Inc., is a worldwide manufacturer of P.C. Board level interconnects. Samtec is the service leader in the electronic interconnect industry. Founded in 1976, Samtec is a privately held, $500M global manufacturer of a broad line of electronic interconnects, including high speed, micro pitch, rugged/power, and flexible board stacking systems, cable assemblies and components, IP68 sealed I/O, and RF components and cables. 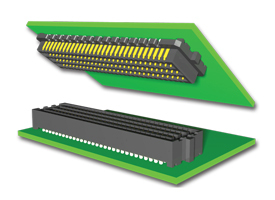 Popular Samtec interconnects include micro pitch board-to-board systems (on .100”, 2mm, .050”, 1mm, .8mm, .635mm, .5mm, and .4mm pitch), high speed mezzanine systems, high density arrays, rugged/power systems, and cable assemblies (IDC, discrete wire, sealed/circulars, flex circuits, and high speed). Samtec RF products include 50 ohm and 75 ohm cable assemblies, connectors and components, as well as micro high frequency U.FL and W.FL systems. Samtec’s Original Solutions include ganged and high isolation cable systems, high performance test point systems, high vibration, and 100 ohm shielded twisted pair cable assemblies. Lead times for standard products are 2-5 days. Samtec Cable Assembly products include high speed assemblies with micro coax or twinax cables. Sealed panel and I/O systems are IP67 and IP68 protected. Also available is a full line of discrete wire, IDC, and FFC cable assemblies, including a broad selection of housings and contacts, as well as hand-tools and semi-automatic applicators. Samtec, Inc. is QS-9000 registered with a 5-A1 Dun and Bradstreet rating, the highest available for a corporation this size. SEARAY™ is a .050” high density, high speed board-to-board interconnect system. The SEAM/SEAF Series open pin field array configuration allows maximum routing and design flexibility. SEARAY™ can be mapped as a single-ended application, differential pair application, or a combination of both. When routed as a single-ended system, SEARAY™ is rated at 5 GHz per pin (at -3dB insertion loss). The contacts in the SEARAY™ system are robust and allow for “zippering” when mating and unmating the connectors. The Edge Rate™ contact lowers insertion and extraction forces, an important consideration given SEARAY™ is available with up to 500 I/Os. SEARAY™ is available in stack heights from 7mm to 17.5mm. SEARAY™ utilizes Samtec’s patent pending solder charge technology to simplify IR reflow termination and improve solder joint reliability. The advantage of this technology, compared to standard BGA/solder ball attachment, is that the interconnects are subjected to extreme heat only once during assembly of the connector to the PCB (as opposed to twice with solder ball attach methods). This becomes more relevant with the higher temperatures required for lead-free processing. SEARAY™ is currently available with a tin-lead solder crimp as well as a lead-free tin alloy solder charge, which is ROHS compliant. 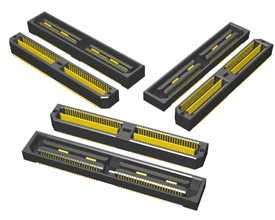 Samtec Q Strip® mezzanine connectors are designed for high speed board-to-board applications where signal integrity is essential. These interconnects are available on three different pin pitches (.5mm, .635mm, .8mm). 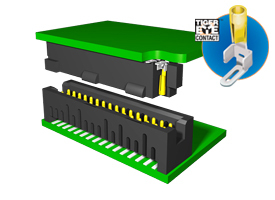 Q Strip® connectors have surface mount signal contacts as well as an integral surface mount ground/power plane between the two rows of signals for improved electrical performance. This ground/power plane is rated at 8.9A at 80C. Mated sets of the Q Strip® connectors are available in eight stack heights from 5mm (.197”) to 30mm (1.180”). Options include guideposts for blind mate scenarios as well as alignment pins and locking clips for proper connector placement before reflow. Versions are also available specifically for differential pair applications (Q Pairs®). The “–DP” option is available with up to 20 differential pairs per bank for a total of up to 100 pairs (5 banks) per interconnect. Samtec’s popular Tiger Eye™ contact is a staple of many rugged interconnect products. The Tiger Eye™ has three points of contact for high reliability and excellent spring properties for high mating cycles. Tiger Eye™ is available in surface mount and through hole pins and is often available with rugged latching features and alignment options. The popular Samtec series includes the 050” TFM Terminal with SFM Socket, and the 2mm pitch TMM Terminal with SMM Socket.